My Wine of the Month for January is Beyerskloof Reserve 2005. This is a one-off bottling from the Groenkloof appellation. Beyerskloof made a small group of appellation specific bottlings that vintage for a European importer. Beyerskloof’s then marketing manager made a presentation of them to my local wine tasting group and we could place orders. This is the last of those I bought. It was graceful in its age after almost 14 years in the bottle, showing lithe fruit with the exuberance of youth smoothed by the years. 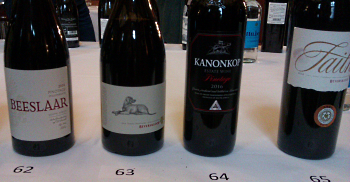 It was fascinating to compare different appellations; my favourites at that tasting were from Bottelary and Groenkloof. To South Africa House. This imposing building standing on the corner of The Strand overlooking Trafalgar Square. Wines of South Africa have managed to assemble most of the 2019 Platter Guide’s Five Star wines for a tasting. It is wonderful to have the opportunity to sample these outstanding wines, but I am rather disappointed that Pinotage is represented by just four. And of all the great winemakers crafting excellent wines from this most South African cultivar, those four wines are the work of just two of them. Anrie Truter for Beyerskloof Diesel 2016 and Beyerskloof Faith 2014 Cape Blend. I tasted the Beyerskloof Diesel 2016 at the beginning and noted its tautness and recorded that it needed time, but I retasted it just before leaving for home and it had blossomed offering sweet fruit, blck plums and berries. Beyerskloof Faith 2014 is a blend of 34% Pinotage, 33% Cabernet Sauvignon and 33% Merlot and is gorgeous, balanced, ripe black fruit underscored by Pinotage sweetness. This was Platters Wine if the Year in the Red Blend with Pinotage category. Kanonkop Estate Black Label Pinotage 2016, is made by from barrels selected from some of the oldest Pinotage in existence and priced in the UK at an eye-watering £140 per bottle. By definition it’s a statement Pinotage, made for long term aging. But here, almost 3 years after the grapes were picked and thus in its youth its showing well. Restrained power, yet it has a freshness and purity of fruit. Eighteen months in new French oak barrels have been seamlessly absorbed and its good drinking, but I think its glory days are to come. This was Platter’s Pinotage of the Year. Beeslaar 2016 is made with grapes bought by Abrie from a single vineyard. This was the most approachable of the Pinotages, open and floral with soft sweet fruits and a refreshing finish. Thanks to WoSA for assembling so many stars in one place. Platter 5 Star wines are rare. Out of 9,000 wines assessed for the guide the top rated ones are tasted again blind by all the judges to decide which get the coveted 5 Stars. The top scoring wine in each category becomes Wine of the Year. Christian Eedes reviews the 2017 vintage of Beeslaar Pinotage here. 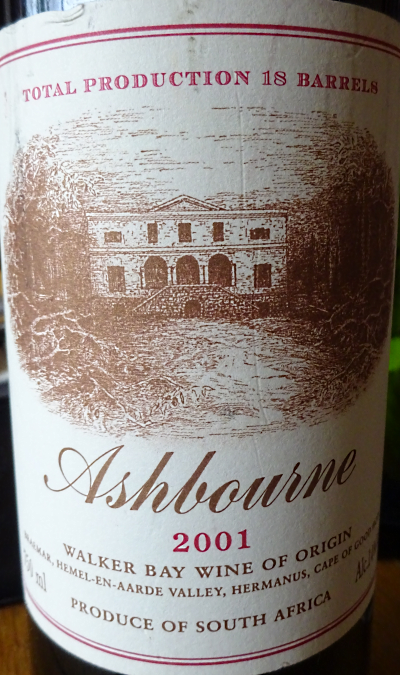 My Wine of The Month for January 2019 is Ashbourne 2001. As you can see from the only label on the wine (above), there is no mention of variety. This is deliberate. Owner Anthony Hamilton-Russell wanted the wine tasted and judged on its own merits without any preconceptions. It is 100% Pinotage from Hamilton-Russell Vineyards’s Bastenburg vineyard. I had tasted a barrel sample of this at the winery back in 2004 (see here) and I thought it would need time. In 2005 Steve Tanzer in his influential US publication - the International Wine Cellar - rated it 92/100. 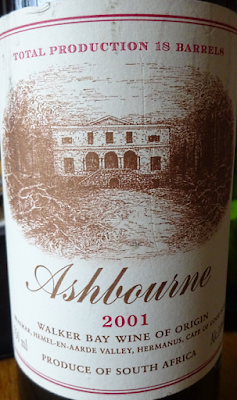 2001 was the maiden vintage of this wine; it was the only bottle I had and I was saving it for a special occasion. I decided I'd kept it long enough and the special occasion was the dawn of 2019. It was delicious. Certainly showing its age, this grand old lady of a wine gave off cedar aromas and tasted of strawberries and violets. Deliciously drinkable, but I wouldn’t have placed it as Pinotage in a blind tasting. I wish I had more. There isn’t an Ashbourne every year; it has to meet Anthony Hamilton_Russell’s exacting standards and comply with his vision for what Ashbourne should be. Later vintages have had other varieties blended in to fine tune the wine to that vision.